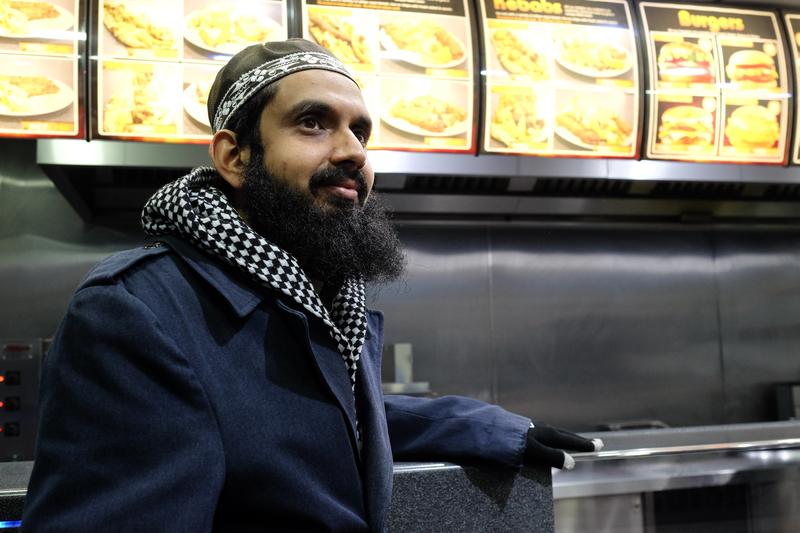 Saleem Seedat, 33, chaplain at Blackburn College. Photographed at the Charcoal Cuisine kebab shop by the college in December 2017. “I was bullied at a young age, both at school and at my mosque. I was shy and I didn’t fit in. When I was 12 or 13, I suddenly realised that trying to fit in wasn’t the right strategy. I just had to be true to myself and what I believed in. I started looking into the meaning of life, and for that I looked more into my religion. As soon as I stopped trying to fit in, I started to attract friends. Alongside my A-levels, I did a part-time A’alim course, the traditional route to becoming an imam. After that I worked in admin roles for the NHS, while studying at an Islamic seminary in Blackburn in the evenings. I then did a diploma at Cambridge Muslim College, where I explored how to use my traditional learning in modern Britain. My religious journey was very personal and I did a lot of my own reading alongside my courses. Because I’d been a victim of isolation bullying, I was confident with being by myself. Studying and pursuing a line of enquiry alone wasn’t frightening.